Update 10/13: A judge has ordered a temporary injunction prohibiting the round up, following a petition by six Israeli human rights NGOs. Expulsion isn’t a viable option for the international condemnation that would erupt if Israel sent thousands of people back to war-torn regions. Instead and to appease racist incitement, Netanyahu’s government passed a law that allows for illegal entrants into the country to be jailed for three years without a trial. And on October 15, MK Yishai intends to start first with 15,000 asylum seekers from Sudan. Please join our October 15th campaign by making a call, sending an email, or sending a fax to the following departments of the Israeli government every day until October 15th. 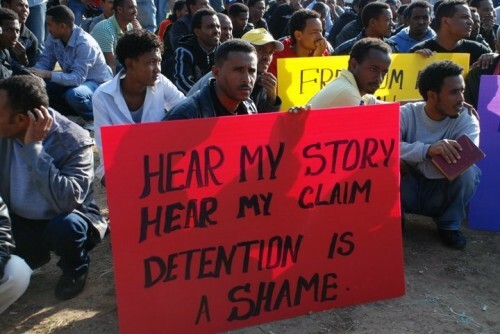 The Interior Minister, Eli Yishai, plans on rounding up and detaining 15,000 Sudanese asylum seekers in Israel if they do not “voluntarily” leave by then. In every photo of these ‘asylum seekers’ I’ve ever seen the percentage of males is overwhelming. Do African countries have some sort of anti-male policies I’ve never heard about? Of course if these ‘asylum seekers’ were simply economic migrants that would explain the disproportions. And there’s no law anyone has agreed to that requires any nation to accept economic migrants. That would be the same Eli Yishai who represents thousands of Haredim who make absolutely no contribution to society (apart from producing more mouths to feed) and who will inevitably be responsible for Israel’s economic collapse within a generation. What would be the most desirable course of action for Israel to take regarding these refugees? Where might cooperation be sought. While we complain to the Israeli government about this, should we American Jews perhaps also be reaching out to our senators, congressmen, and president to offer to offer them safe haven? 1) Develop a fair Refugee Status Determination procedure that allows for each individual to apply for asylum and provides protection and support for refugees in line with all other Western democratic countries. 2) Change its deportation process asylum seekers are not deported and so that they have ample time to prepare for deportation after undergoing Refugee Status Determination. 3) Cease to build the massive detention center in the Negev desert that arbitrarily imprisons asylum seekers indefinitely. Right Now supports an immigration policy in which, through a fair and effective Refugee Status Determination process, the case of each individual asylum seeker is researched and heard resulting in the determination of refugee status on a case-by-case basis. We recommend that Israel create a quota system in which at least 2,500 refugees per year are provided with permanent or long-term temporary residency and awarded support services as refugees in line with the Refugee Convention, including the right to work, the right to an education, the right to health services, and the right to travel freely in and out of the country. And the orthodox Canadian Jew who taught Israel’s RSD employees is now speaking out in shame. Where are the organizations? Where are all those lovely groups who patted themselves on the back when it came to Ethiopian Jews? Not such a fan of gentile Africans fleeing oppression? I’d just like to point out that, back in 2001, a friend of mine, an illegal migrant from Ukraine, was detained and held by the then INS for one year and three months until the Ukrainian government agreed to pay the bill for his repatriation. Otherwise, I suspect he would have been held indefinitely, or until he earned the money to pay for the plane ticket himself (they allowed him to make $1/day doing chores at the detention center). I’m not saying holding migrants in detention is just, but it is fairly common. Of course, this solves nothing long term. In 3 years Israel will still have the same 15,000 people who either have to be released from detention, or re-incarcerated, should their countries of origin remain war-torn holes in the ground. I think Israeli taxpayers can find better things to spend their money on than feeding, clothing and housing 15000 people, but that’s just me.